Tensions between Washington and Moscow have continued to escalate over US allegations that Russia is establishing a “forward-operating air base” outside the northwestern port city of Latakia in preparation for a more direct intervention in support of the government of President Bashar al-Assad against Islamist militias armed and supported by the US and its regional allies. The US State Department reported that Secretary of State John Kerry telephoned his Russian counterpart, Foreign Minister Sergei Lavrov Tuesday for the third time in barely 10 days to warn against continued Russian backing for the Assad regime. Kerry apparently reiterated earlier statements that the only legitimate Russian role in Syria would be in subordination to the so-called “coalition” cobbled together by Washington and led by the US and its regional allies, Turkey, Saudi Arabia and the other reactionary Sunni oil monarchies of the Persian Gulf region. In an earlier conversation, Kerry issued an even more blunt threat that any expanded Russian presence in Syria risked “confrontation” with the US military, which is conducting air strikes inside the country. This US-led air war is threatening to heat up, with Australia announcing that its warplanes launched their first air strikes inside Syria on Monday, claiming they were directed against Islamic State of Iraq and Syria (ISIS) targets. French Defense Minister Jean-Yves Le Drian, meanwhile, told France Inter Radio Wednesday that French warplanes would launch their own air strike in coming weeks in an attempt to stop ISIS advances, particularly near the city of Aleppo, Syria’s largely destroyed former industrial and commercial capital. So-called “rebels,” Islamist forces that Le Drian insisted on still calling the “Free Syrian Army,” carried out a murderous mortar shelling of the western pro-government section of the city on Tuesday, killing 38 civilians, 14 of them children. 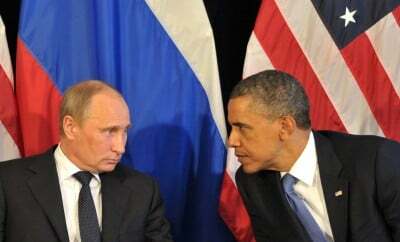 Increasing the danger of a military clash with Russian forces, Washington has broken off military-to-military relations with Russia as part of its campaign to isolate Moscow over its annexation of Crimea following last year’s US-orchestrated, fascist-spearheaded coup in Ukraine. Secretary of State Kerry acknowledged Wednesday that Russia had proposed the resumption of such talks in order to “deconflict” any encounters between the two countries’ military forces in Syria. He indicated that the request would be discussed but made no commitment to such contacts. Russian officials have denied that Moscow is carrying out any direct intervention or qualitative buildup on Syrian soil, while insisting that its aid to the Syrian government forces is crucial to defeating ISIS and other Islamist forces seeking its overthrow. Speaking Tuesday at the Collective Security Treaty Organization in Dushanbe, Tajikistan, Russian President Vladimir Putin defended Russian military aid to Syria. “We are supporting the government of Syria in the fight against a terrorist aggression, and we are offering and will continue to offer it necessary military and technical assistance, and we call on other countries to join us,” Putin said. Washington and its regional allies have insisted that no compromise is possible outside of Assad’s ouster. Some European officials, however, have called this policy into question, fearing that a precipitous collapse of the Assad regime would only result in either ISIS or the Al Qaeda-affiliated Al-Nusra Front overrunning Damascus. British Foreign Minister Philip Hammond, suggested last week that Assad could remain in office during a six-month “transitional period,” a scheme that was rejected by the Syrian government, which questioned the right of London to impose the length and outcome of such a process. Officials in Moscow have insisted that Russian planes flying into Syria have carried both military and humanitarian supplies. While Washington had pressured the governments of Bulgaria and Greece to deny Russia permission to make these flights through their airspace, they have since shifted to a route over Iran and Iraq. US officials have declined to comment on whether they sought to similarly pressure the regime in Baghdad, their supposed ally in the war against ISIS. “An average of two giant Condor transport aircraft have been landing every day for the past 10 days at the [Latakia airport], while cargo ships have been docking at a Russian base in the port city of Tartous,” the McClatchy news agency quoted a US official as saying. It reported that deliveries thus far have included “pre-fabricated housing for 1,500 people, six advanced T-90 tanks, 36 advanced armored personnel carriers and 15 artillery pieces,” together with the deployment of some 200 Russian Marine commandoes. If this inventory is accurate, it is a drop in the bucket compared to the military hardware and personnel that Washington has poured into the region. Far greater stockpiles of US weapons are now in the hands of ISIS after it routed Iraqi forces in Mosul and elsewhere, capturing their arms and equipment. Over 3,000 US troops, meanwhile, have been deployed to Iraq, while US warplanes are conducting round-the-clock sorties over Iraq and Syria. Despite this deployment, however, Washington has little to show for a year of bombing ISIS. The Islamist militia, according to intelligence reports, has just as many fighters and continues to control at least as much territory as it did a year ago. What is clear is that Washington’s principal objective in Syria is not the defeat of ISIS, but rather regime change. Its aim is to deprive Russia of its one ally in the Middle East—and its sole foreign naval base—as part of a broader strategy of militarily imposing US hegemony over the energy-rich region, and more broadly over the Eurasian landmass. To that end, US imperialism is escalating its military threats against Russia. Pentagon Comptroller Michael McCord, in an interview with Bloomberg news, indicated that the US 2017 military budget is being reshaped largely in preparation for a confrontation with Moscow. This follows earlier testimony by President Barack Obama’s nominee for chief of the Joint Chiefs of Staff, Marine Corps Gen. Joseph Dunford, that Russia “could pose an existential threat to the United States” and that its actions were “nothing short of alarming.” Significantly, Dunford ranked Russia as a far greater threat than terrorism.